Look Ma, no table saw! About two years ago, I started thinking about making a major change to my woodworking and wanted to write a bit about the journey, just in case others are in a similar situation. Most woodworkers consider a table saw to be the centerpiece of the shop and an indispensable part of their woodworking. Learning woodworking in school shop class, I was indoctrinated with the same thinking. At some point, however, I started to question whether that was really true for me. First off, my shop is only about 110 sq ft and the table saw took up an inordinate amount of room. Secondly, I was needing some capabilities not easily provided by my arsenal of machinery at the time. Not long after that train of thought started running, I heard an interview with Michael Fortune, who is a professional woodworker in Canada. In the interview, it was brought up that he doesn’t have a table saw in his shop and utilizes a band saw centric shop, instead. That thought rattled around for a while and I decided that instead of making a rash decision that might be regretted later, I would map my work for a year and figure out if a table saw was really necessary. 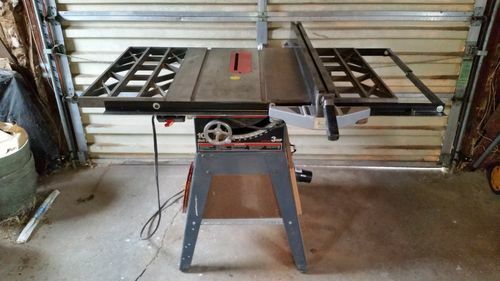 At the end of that year, I hadn’t come up with a single task that couldn’t be done without a table saw and several that would have been much easier with a band saw, so this past spring the table saw went up on the online classifieds . . . .
. . . . . sold within a week and was replaced by a Shop Fox W1706 14in band saw. In the over six months since the change, I have no regrets. The biggest gain was a lot of space. The band saw tucks back against the wall when not in use and has allowed me to bring some other things into the shop that never would have fit before. It used to be that when working at my bench, I was constantly bumping into the table saw behind me and having to adjust how I was standing because of the lack of space. That is no longer an issue. The major task of the table saw was ripping material to width and the band saw handles that with ease. Yes, it leaves a bit rougher cut, but those are quickly cleaned up with a hand plane. Dadoes and rabbets are done with hand planes or a router. Cross cuts are now mostly done with hand saws, either off the saw bench or with the miter box, and cleaned up with a shooting plane and board. The saw bench is one of those items that just didn’t fit in the shop before, but now has a home. There are definitely occasions where a table saw might have been faster, but there are also situations where the current way is faster or better. Six of one, half a dozen of the other. There have also been some changes the other way. I’ve been able to safely work on smaller pieces and have done a lot of resawing to get thinner stock that just wasn’t very easy to do before. I’m not saying that anyone else should sell their table saw, as every situation is different. In my case it works because of the small space and the fact I do a lot of hand tool work. If my shop was large enough to easily accommodate a table saw and a really good bandsaw, I might never have made the decision. Now, however, I think that even with a larger shop, I would just add another, larger bandsaw dedicated to ripping and keep the Shop Fox for smaller work. Thanks for this post Jay. I’m kind of coming at it from the other direction myself, and coming to a similar conclusion. I started out as almost 100% hand tools (still the only stationary power tools I have are a bench top drill press, and a scroll saw). It’s a hassle to get out the routers, circular saw, or jig saw, so I generally don’t. I’m also thinking that a band saw fits best into my method of working at the moment too. Something to take the place of ripping lots of boards by hand, and resawing. Nice write-up Jay. My son is in as small a space as you and has had no table saw, so a few years back, I bought him a Grizzly (G055 I think) with a riser kit. He does a lot of resawing when building guitars and really loves it. I don’t use my table saw for much, but it’s not something I’m ready to get rid of either. A better bandsaw that supports re-sawing would be a step in the right direction; the process now means trace cuts on the edges of boards before heading to the bandsaw. The DeWalt RAS is a power tool that is a fixture in the hand-tool side of the shop; I’ll never part with that. Congrats on the journey, sounds like you’re in a better place with the work you do. Smitty, my dad’s shop is based around his RAS and that is what I learned on from an early age, until school shop classes. I don’t expect that very many will pursue the path I’ve taken, as the table saw is a very powerful and versatile piece of machinery. I just want to document the journey and give some food for thought. Good to see you got it worked out and I can see with the space you have available that you went this way . My uncle had a commercial shop back in the sixty’s and seventy’s with several employees and also had no table saw and it worked just fine but being a commercial shop he had a planer and shaper and a 30” band saw . What works best for the user is awesome. I moved about a year ago. At that time I built a new shop 16×16, larger from by 10×12, wiht an 8×10 addition on one side through a door. Amazing that all those tools were in there and used regularly. I have considered the possibility of getting a RAS as it does many of the TS functions. I could incorporate it into the bench I built for the Ridgid Miter Saw and save some space. I use a lot of pallet wood for projects and/or other recycled wood. I am still thinking. Jay, like your post says, it might not be for everyone but it works for you. And that is the most important point. I can’t imagine not having a table saw in my shop but I don’t have a band saw either. I do covet one like a rabbit covets a carrot. Hopefullyi will get one soon as it will be instrumental in my future plans in woodworking. One question though, why just a 14” saw and not a larger one with more capacity. I would think that a bandsaw centric shop would have a 16” to 18” saw at a minimum. Using your bandsaw so much, what blades have worked for you? Your guide setup? A) Space. A 14in saw is doing everything I need and takes up far less space than a 16 or 18in saw. B) Power. I do not have 240V power available in my shop right now. I could run a 240 line out there, but for a couple issues. I plane to tear down and rebuild the garage and shop in the next couple of years, so don’t want to invest a lot in the current structure. Also, the main panel in the house is maxed out and needs upgraded before I can add any more breakers. That will have to be done before the new garage & shop, but wasn’t ready to do it yet. Once the new shop is built, I’d like to add a larger saw. I use Olson blades, mainly because the stores I work for sell them. I keep one of the MVP carbide tipped 1/2×3TPI blades on the saw most of the time. Works great for ripping and resawing. Guides are the stock roller guides, set according to the Alex Snodgrass recommendations. Very interesting especially since I have had this debate going on in my head as well. I still have my craftsman job site TS, and I hate even turning the darn thing on. Its dusty, noisy, less accurate than I would like, always in my way (I’m a member of the small shop club too) and in general the one tool I would most like to avoid in my shop. Unfortunately I can’t go without it right now as I am still turning my space into a wood working shop on a tight budget. I will have to consider if a band saw will fit my needs in the future, but your success certainly makes it a viable consideration. Glad the BS has worked out for you Jay! 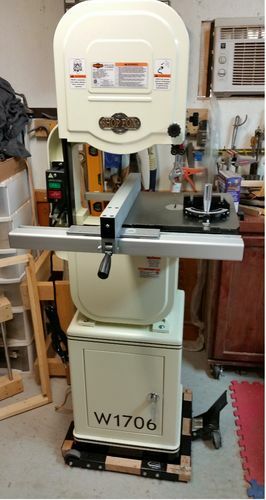 I’m not getting rid of my TS anytime soon but, I upgraded my from a 80’s model “3-wheeler” bandsaw last year to a 10” benchtop model and have started using it A LOT more than I used to. It’s so quick and convenient that I could definitely see the appeal of having a nice 14” as the workhorse of the shop. I have never had a dedicated “Table Saw”. I’m a Shopsmith owner. On the rare occasion I feel I need a table saw, I can set it up (albeit a small table saw) I definitely enjoy also having a variable speed 12” disc sander, Lathe, Drill press and Horizontal Boring Machine. Also available to me as Special Purpose Tools that use the SS as a power head are a 4” Jointer, Jigsaw and 11” Bandsaw (with 6” resaw capacity). I use the bandsaw a lot. I also have a variety of arbors for grinding wheels, buffing wheels, sanding wheels and the like. For a Hybrid wood worker like myself, this option gives me the most flexibility in the small foot print I have to store everything in. A Shopsmith is not for everyone but it’s what I learned on and it works for me. It’s not the tools that make a Craftsman but how well they use what they have. JayT, Thanks for sharing that. I’ve been contemplating the need for a table saw as well. Granted I haven’t really started any real projects yet but I have found it easier to grab a hand saw than to move things out of the way to wheel the TS out to use. Plus the hand saw is quieter and less dusty. So it’s good to hear that view from someone that’s actually been productive.